The Istanbul Strait Road Tunnel Crossing was one of the most challenging tunnel projects in the world. Photo: Herrenknecht. As urban areas become denser, open space for new infrastructure is less available and more and more clients are looking underground as they envision projects involving transportation infrastructure, utilities, water, wastewater, power and other systems. As a result, the number of tunnels under construction will continue to grow as city, county and state planners recognize the value of subsurface structures in addressing surface space constraints. Unfortunately, many of the “easy” places to build tunnels have been used over the past 100 years and those locations previously dismissed as too challenging are being reconsidered. The good news is that tunneling and tunnel boring technology has advanced to allow construction of tunnels in locations and in geology that engineers would not have thought possible just a decade ago. In addition to being able to tunnel in more difficult ground, the size of tunnel-boring machines is getting bigger and their control systems becoming more sophisticated, allowing them to reduce surface impacts due to settlement and excavate tunnels with higher groundwater pressure than previously possible. Today’s complex underground structures and tunnels must be designed to continue to function during emergency situations such as an earthquake, fire, flooding, or other improbable incidents affecting tunnel services. Through proven best practices and use of innovative materials and construction techniques, engineers are making today’s tunnels safer than ever. As examples, new segment gasket materials keep tunnel linings flexible and watertight in service, TBMs are designed with watertight seals during construction, and advanced heat and smoke detection devices and coordinated ventilation and water misting systems, as active fire protection systems, allow more time for occupants to evacuate safely. Passive fire protection has advanced as well to include special tunnel liner designs that help the tunnel permanent support maintain its structural integrity during a tunnel design fire event, significantly contributing to tunnel safety. Tunnel boring machines are very cost effective for constructing tunnels with a length of at least a mile. In the last few years these machines have gotten both bigger and more sophisticated. TBMs, such as earth pressure balance and slurry pressure balance systems, cause less disruption to structures on the surface and utilities. This is because EPB and SPB machines better control the movement of ground in front of the machines during excavation, which translates into less settlement at the surface. A prime example is “Bertha,” thee record-breaking TBM that was used to dig the SR 99 roadway tunnel in Seattle. The SR 99 Tunnel, which has an excavated diameter of nearly 58 ft, has enough space inside the tunnel to contain a two-level roadway, continuous egress walkways, and an advanced single point extraction ventilation system. It was constructed to replace the aging Alaskan Way Viaduct along Seattle’s downtown waterfront, thereby eliminating visual impacts and noise, and freeing up space for tourist activities and green space. Bertha began digging the nearly 2-mile-long tunnel under the central business district of downtown Seattle in the summer of 2013 and the tunnel broke through in April 2017. Bertha was a massive tunnel boring machine with a cutting head that was 57.3 ft in diameter with the forward shields that were 64-ft long with segment erection and support gear that trailed behind the cutter head for nearly 300 ft. The shields and cutter head weighed over 6,000 tons and the TBM cost approximately $80 million. 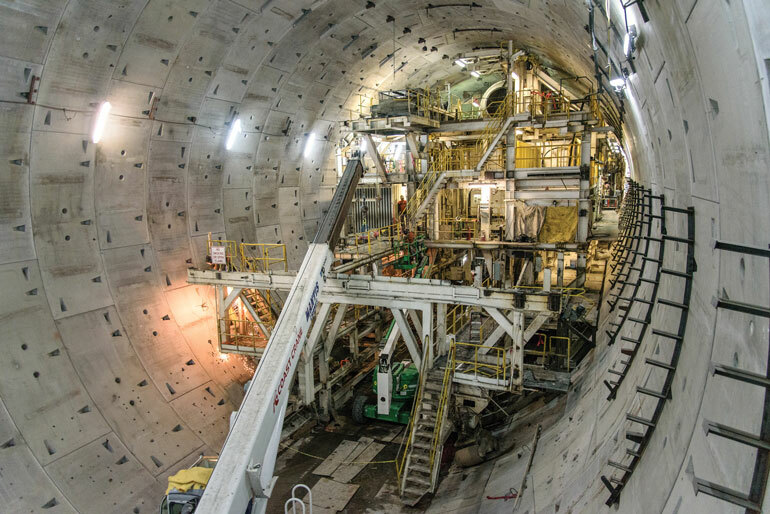 Bertha was able to excavate through the glacial soils beneath Seattle and place 2-ft-thick precast liner segments at an average rate of 35 ft per day. As Bertha dug, debris was simultaneously removed on a conveyor belt. Mechanical issues caused Bertha to undergo repairs; after those, the machine’s sophisticated technology proved itself through an exceptional performance, especially for controlling surface settlements. Mechanical issues caused Bertha to undergo repairs; after those, the machine’s sophisticated technology proved itself through an exceptional performance, especially for controlling surface settlements. Photo: WsDOT. The Sequential Excavation Method has become widely used for the construction of tunnels. This method integrates continuous monitoring of the behavior of rock and soil masses during excavation with the selection and application of various types of ground support, dynamically meeting the changing underground conditions and requirements. This method has allowed the excavation of shorter tunnels that would not be cost effective to excavate with a TBM. SEM tunnels are typically lined with an initial layer of shotcrete to stabilize the opening, followed by a subsequent shotcrete or cast-in-place reinforced concrete lining. SEM frequently is referred to as an observational “design as you monitor” approach, based on measured deformations of the supported ground including convergence and divergence in the lining and mapping of prevailing rock conditions. The tunnel is sequentially excavated and supported, and the excavation sequences can be varied to address ground conditions. 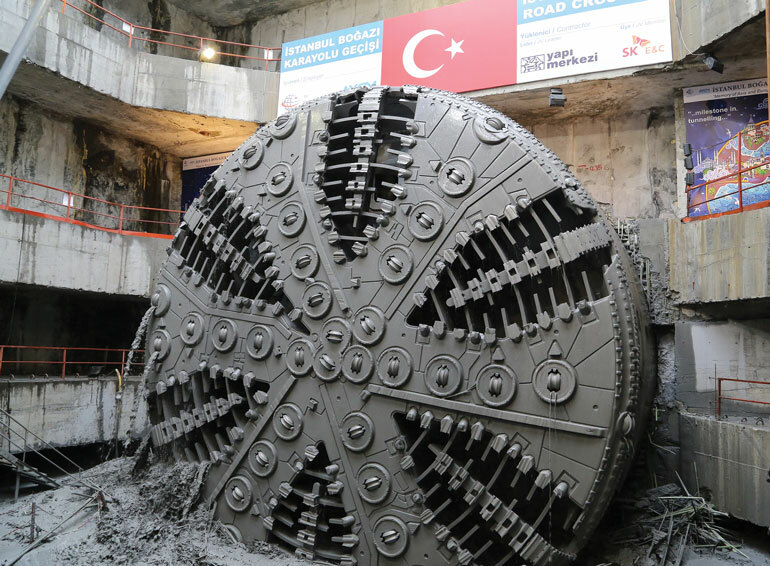 SEM was utilized in construction of the landside portion of the Istanbul Strait Road Tunnel Crossing, one of the most challenging tunnel projects in the world. Opened to traffic in December 2016, it passes 300 ft beneath the water of the Bosphorus that divides the Asian and European sides of Istanbul, Turkey. The tunnel for a stacked roadway was bored using a TBM that transitioned to two side-by-side (twin) tunnels on the Asian side via transition sections, all constructed using SEM construction techniques. The twin tunnels were excavated through poor quality rock to connect to an existing freeway network. The complex demands of the project required that special attention be given to design of the bored tunnel lining segments, gaskets, and bolted connections, as well as the initial and final lining of the SEM tunnels. The fact that modern TBMs are capable of great control of surface settlement has a very positive impact on overlying and adjacent businesses and surrounding communities, lowering probabilities of construction delays and related claims. Modern TBMs are larger diameter, have more sophisticated excavation technologies and cost more than the previous generation of equipment. Yet the new machines can often excavate faster, with less risk and less surface settlement, thus saving money in the long run. The fact that modern TBMs are capable of great control of surface settlement has a very positive impact on overlying and adjacent businesses and surrounding communities, lowering probabilities of construction delays and related claims. Limiting these types of disruptions saves time and money on projects. It also benefits local economies, and makes taxpayers and their governing bodies more open to tunneling projects. 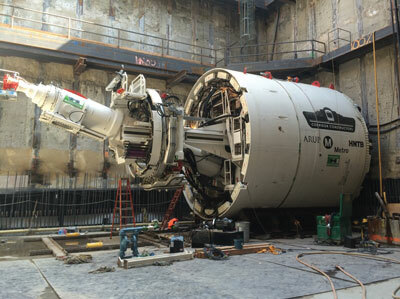 Larger TBMs enable the digging of tunnels that have enough space for two trains. Previously, two smaller tunnels were excavated side by side with a single train in each tunnel. Small tunnels were mined using SEM techniques to connect the two tunnels and allow egress from one tunnel to the other in the event of an emergency. Sizable risks were associated with the construction of the cross passages that connect twin bores. With a single large tunnel using a center wall down the middle to separate the tracks, two trains can now run through the same tunnel. This eliminates the need for cross passages construction while their function is provided via openings in center wall with sliding doors and continuous emergency walkways on either side of the center wall. This solution reduces the construction risks related to cross-passage excavation and provides for more economical solution to emergency egress from incident to non-incident tunnel during fire emergency. It may also provide for closer spacing of passages between the two tunnels via construction of additional sliding doors in the center wall. The evolving technology of tunneling is not merely a story of machines getting bigger. Microtunneling, which did not exist until the 1980s, allows for the excavation of tunnels in the range of 2 to 8 ft in diameter. This is being done unmanned, by remote control. And these tiny tunnels are going places that we never would have considered previously, such as under rivers, diagonally beneath neighborhoods, and under highways, railroads and airport runways. New technologies are allowing projects to go smaller as well as bigger. As demand grows for tunnels in challenging locations, engineers must stay abreast of changing technology and how to apply the new methods and machines to best benefit the construction of a project and reduce impacts to the public. Doing this requires a variety of actions and methods. To mitigate risks, tunnel engineers must optimize usage of a wide range of available machines and methods and apply the latest technologies and materials. It is also crucial to understand local constraints, and effectively communicate how new methods and technologies can benefit not just the project itself, but also the local and regional environment where the project is located. In addition, tunnel project leaders need to maintain an open dialogue with contractors to make sure they understand the best use of new technologies. The planning, design and construction of tunnels must be integrated with proper selection of machines and methods to prevent potential problems and yield successful projects that serve their intended purpose. There is a symbiotic process at work here. The need to tunnel through more challenging areas drives technological innovations to make such tunnels possible. New techniques and technologies present members of our profession with exciting opportunities to help shape the future of our global transportation network. The challenge for us is to utilize those opportunities in ways that best serve the needs of our clients and communities. Gordon Clark is HNTB’s technical director of tunnels and complex underground structures, and vice president. Mark Ramsey is HNTB’s West Division tunnel practice lead.